Marseilles was awash in pomp and circumstance on April 16th, 1916. Military bands played marching songs and patriotic music, as throngs of French citizens flocked to the waterfront, eager to meet the arriving vessel the Himalaya. Thousands of wide-eyed young men trampled off the causeway, many with musty uniforms and salt-corroded brass – remnants of the group’s more than two-month journey to the Western Front. While all of these young men had been born and raised in an urban, industrialized environment, for most of them it was their first trip to a foreign country. The experience was overwhelming for men who just months earlier hadn’t even been in military service, and were now showered with attention from local French dignitaries and beautiful French women. Only these weren’t French soldiers. Or British. Or even colonial troops from one of the Western Allies. 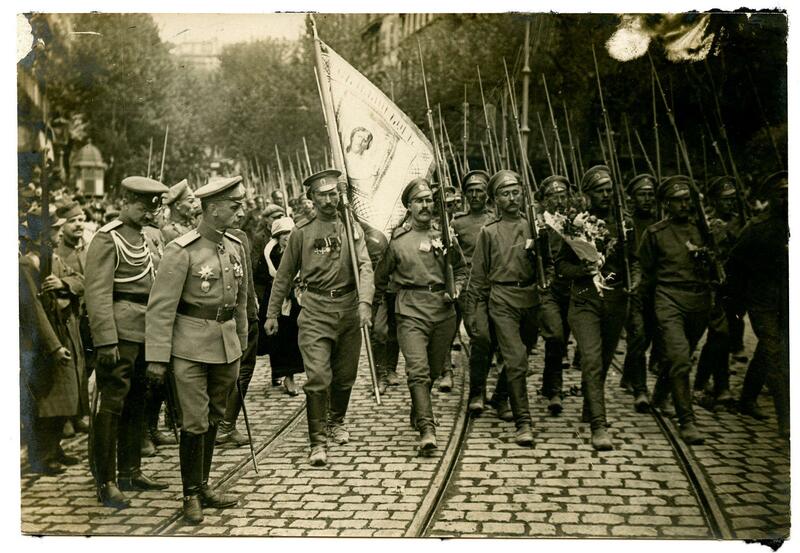 The nearly 9,000 men marching through Marseilles were the soldiers of the Russian 1st Special Brigade – the first of nearly 50,000 Russian troops who would serve on the Western Front. The vast expanse of the Eurasian Steppe had long conjured the image that within the Russian Empire were multitudes of men ready, willing, and able to serve the Tsarist military machine. The “limitless” manpower of Russia had been so ingrained in Western popular opinion, that it came to be believed as well by the country’s ruling elite. Despite the monstrous losses incurred on the Eastern Front in just a year and a half, few in St. Petersburg, London or Paris feared that Russia would – or could – reach a breaking point when it came to fielding an army. As the Entente attempted to coordinate their efforts at Chantilly in December of 1915, the belief that Russia’s “endless reserves” could be put to better use on other fronts began to gain traction. While the generals met, the French politician (and future President) Paul Doumer toured St. Petersburg, floating the suggestion that 300,000 Russian troops be transferred to the Western Front in exchange for additional French supplies. The idea horrified the Russian General Staff. The Tsar’s armies had lost over 5 million men in just over a year of fighting, and the Russian army was still facing a massive rifle storage. St. Petersburg couldn’t properly clothe, feed or arm their soldiers – how could they possibly transfer hundreds of thousands of men on top of that? The practicality of the decision was immaterial – Tsar Nicholas II supported it. All the General Staff could do was limit Russia’s contribution. The first Russians that arrived in Marseilles represented a small triumph of negotiation. While the men wore Russian uniforms, they held French rifles, carried French artillery and were fed by French supplies. Each man had twice the needed number of clothes and each brigade had it’s own field kitchen. The French had paid for their new soldiers, armed and clothed them, and transported them in their own ships. For that cost, the men (new recruits out of St. Petersburg) would be led by Russian officers and have at least tactical autonomy. As the five Russian brigades slowly arrived in France over the course of 1916, the Entente had little idea what to do with them. It was becoming rapidly apparent that France and Russia’s “soldiers for supplies” transaction would bankrupt both nations. The Russians couldn’t possibly raise 300,000 men beyond their own needs, and France could barely meet the strenuous material requirements of their own army. With the arrangement dead in spirit, the fate of the Russian Brigades disappeared from the considerations of the Entente. Even with the horrific losses being sustained at Verdun and the Somme, the Russians were still viewed as little more than trench fillers, best used to hold down sectors of the front with little activity to free up experienced French troops to fight. Using the same logic, additional Russian brigades were transferred to Salonika, placing 20,000 Russians on the unused Greek front. Despite being badly needed at home, and forgotten in France, the Russian Brigades were staying put. Starting in April of 1916 until September of that year, the Russian Brigades would train at Mourmellon-le-Grand-Auberive in the Champagne region. The sector was largely quiet, save for a German attack in mid-July that the Russians repelled with relative ease. For most of 1916, the Russian existence on the Western Front was one of well-fed, well-trained boredom. 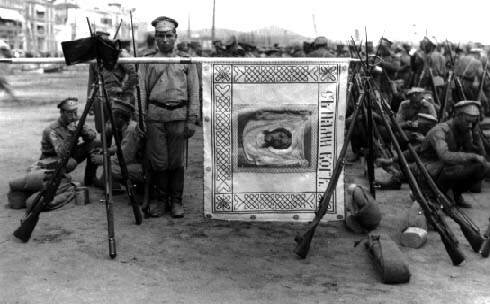 Between the lack of combat, and the heavily censored letters from home, the young men of the Russian Brigades had little concept of the larger direction of the war – or its hardships. By January of 1917, four brigades totaling over 44,000 troops were in place on the Western Front. An additional three brigades were said to be forming to join them, placing in theory more than 70,000 Russian soldiers in France by the spring/summer. The remaining brigades would never arrive. For the Russian Brigades already in the trenches, a German gas attack in January caught the unit completely by surprise. Ill-trained to withstand poison gas, the Russians lost heavily. It was the Brigades’ first real taste of defeat. The units no longer had the good fortunate to be “forgotten” with the ranks of the Entente. Following their gas attack debacle, the Brigades were transferred just north of Reims to assist the French in their forthcoming Nivelle Offensive (named after the new French Commander-in-Chief, Robert Nivelle, the commanding general of Verdun’s bloodletting). The timing couldn’t be worse. As the men prepared in their trenches for the wave assaults Nivelle had in store for them, word of Tsar Nicholas II’s abdication filtered through the ranks. Did the Tsar’s fall mean the end of the war? Were the Brigades still expected to attack? Much like what was happening across Russia at the time, the Brigades formed soviets to debate and vote on their future participation in the war. Following the experience of the gas attack months earlier, there was little appetite among the men to continue to fight. Almost all agreed that they wanted a speedy repatriation back to Russia. Yet others argued that they couldn’t abandon their French compatriots on the literal eve of an offensive. By a narrow majority, the soldiers voted to go ahead with the attack; with the provision that the Brigades would be returned to Russia shortly thereafter. The Nivelle Offensive was a catastrophe. Despite a 2-to-1 advantage in soldiers, supported by 7,000 pieces of heavy artillery and 128 Saint-Charmond tanks (the heaviest tank in the French army), the Entente suffered 187,000 casualties in three weeks of fighting. Of the total, 4,500 Russians fell to German guns. The Brigades had fought extremely well, taking the town of Courcy, along with 500 prisoners, and holding their position for three days against German counterattacks. French President Raymond Poincaré was so impressed by the Brigades, he awarded their commander the Légion d’honneur. France’s attitude towards the Russian Brigades would soon change. For the Brigades, the Nivelle Offensive had represented their last contribution to the Entente war effort. As the unit was pulled out of the front line rotation, the men assumed their demands had been met and that they would be returning home. Instead, the units were confronted with needing to take a new oath of allegiance – now to the Russian Provisional Government instead of the Tsar. Many refused. The 1st Russian Brigade – made up of those first young men down the causeway in Marseilles – openly rebelled, chanting “to Russia and nowhere else!” The soldiers refused to even drill, claiming it was unnecessary since they were going home. Unsure how to proceed, the Russian Provisional Government made an offer – the rebellious troops who took their loyalty oaths would eligible to return home. Liaisons from St. Petersburg even began preaching to the other units in the Brigades that the reason they were still in France was because of the 1st Brigade’s refusal to submit. Dissension was growing in the ranks. At the same time, the position of the French Army was coming apart at the seems. The failure of the Nivelle Offensive (Nivelle had bizarrely boasted to his men that his offensive would end the war “in 48 hours”) had caused a crisis of confidence in the French line. Whole divisions refused their orders, and the actions of the rebelling Russian Brigades, not the suicidal human wave tactics that had decimated the French nation, were blamed. 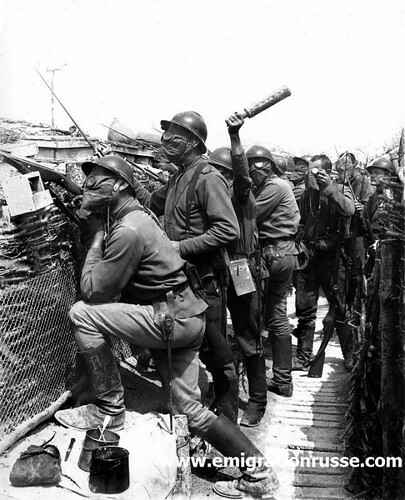 The 1st Brigade was immediately quarantined at their base in La Courtine, cut off from pay or rations. Thousands of French and loyalist Russian troops surrounded the encampment. The situation was made clear to the rebelling units – either submit or be shot. By the morning of September 3rd, 1917, whatever limited patience France and the Provisional Russian Government had was gone. Artillery rained down on the 2,000 men within the 1st Russian Brigade; most of it fired by members of the 3rd Brigade. The shelling would continue for three days until the mutineers of the 1st Brigade surrendered. For the survivors, the original demand to sent back home to Russia would in fact be realized – albeit after a brief stint in a French prison camp in North Africa. Eager to be rid of what French authorities viewed as the cancer that had caused their own mutinies, many of the 1st Brigade were returned to Russia amid the collapse of the Provisional Government. Others simply decided to stay in France and escape the burgeoning civil war of their homeland. Between the mutiny of the Brigades, and the dissolution of the Provisional Government back home, thousands of Russian troops were left in a political and military vacuum in 1917. Neither wanted by the authorities in France nor the new Bolshevik leadership in Russia, some remnants of the Russian Brigades chose to stay on the Western Front and fight. 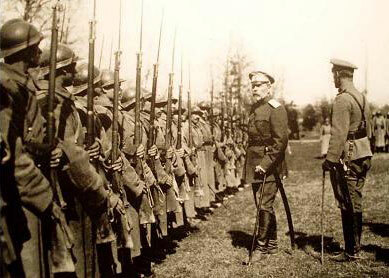 In the fall of 1917, General Zankevich (commander of the Russian Expeditionary Force in France) wired St. Petersburg for permission to form a Russian Legion to continue the war in the West. The Legion’s first meetings looked very much like the early soviets of the rebellion – held outdoors and open to officers, NCO’s and rank and file alike. The group would hold an odd political mix of royalists, Bolsheviks, army careerists and many average Russians caught between the political currents dragging Russia into their undertow. The thin unifying reed of the group all being Russians largely abandoned in a foreign land was apparently enough to form the group into a cohesive military unit. Still under Russian command, but as a part of the French 1st Moroccan Infantry Division, the Russian Legion fought valiantly amid the furious German spring offensives of 1918, suffering terrible casualties. By the time of the armistice of 1918, the unit was down to just over 500 men, and while the group had won numerous metals, there was little interest in the French Army for keeping the soldiers within the French ranks. The unit was demobilized, sending hundreds of men into the void of what to do next. Some, like future Soviet Minister of Defense Rodion Malinovsky, chose to return home to Russia despite the bloodshed. Most chose to stay in their new adoptive homeland, becoming French citizens. Most chose to stay in their new adoptive homeland, becoming French citizens.